Berkeley Lab Postdoc Association – The Berkeley Lab Postdoc Association is an organization run by and for about 1000 postdocs and early career scientists working at the Lawrence Berkeley National Lab. We organize many activities to strengthen our ties to the Lab, to each other and to the (Berkeley) Bay Area. Our goal is to facilitate social interactions, scientific exchanges, seminars and general orientation. Join a "Spring Celebration" Meet&Greet on Thursday, April 18, 4:00 - 5:00 pm on the cafeteria patio with special guests, our peers from the Mathematical Science Research Institute. At 5:00 pm we invite you for an Advanced Light Source tour. Read More "Meet & Greet"
Wanna learn how it is to bike below the sea? Join our cultural lunch on April 26th, 2019 when Arnoud Everhardt, a postdoc in the Materials Sciences Division, tells us about his home country - The Netherlands: biking below the sea. We will meet at noon in Perseverance Hall 54-130. Read More "BLPA at National Postdoc Annual Conference"
Read More "Hike Mount Diablo"
Read More "LINC Launch March 27th"
Welcome to our March new postdocs at Berkeley Lab! Download presentation. Read More "Postdoc Orientation – April 2019"
Read More "Biotech by the Beach – Santa Cruz"
Read More "Cultural lunch with Laurie Stephey – Florida"
BLPA is made up of volunteers – and we are always looking to grow! Are you interested? Do you want to know about the inner workings of BLPA and contribute to the postdoc community, building a larger network? 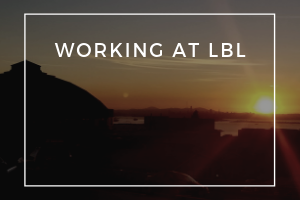 Please contact us (postdoc (at) lbl.gov) or sign up to check out one of our many committees!